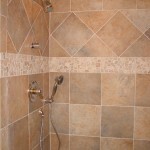 Looking for a way to spice up your shower? 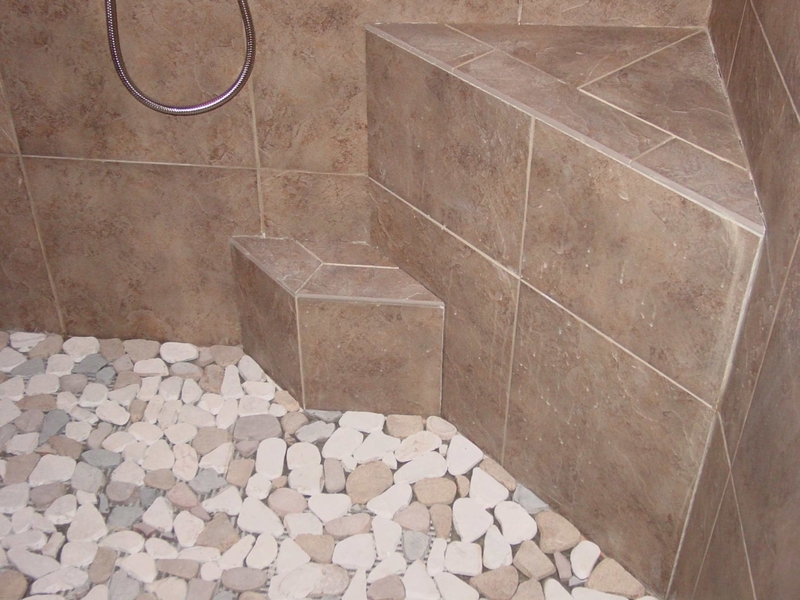 Whether you are building a new tile shower or renovating an older one, you can install small river rocks, sometimes called pebbles. 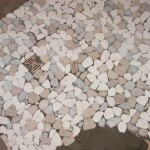 The rocks might be whole or sawn into thin segments that can be laid flat. 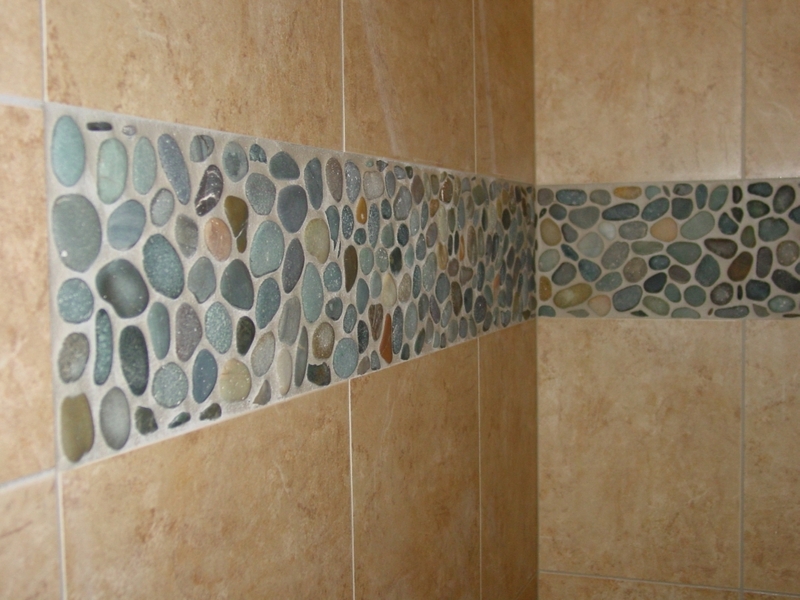 If your pebbles are purchased from a tile store they will almost always be mounted on mesh or perforated paper backing and sold in sheets. Pebbles (river rocks) mounted on backing are much easier to install than loose ones, but there are some problems. First off, the sheets don’t go together well, and if you install them as is and grout them you’ll see division lines between the sheets. 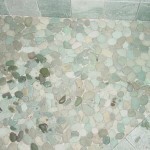 The remedy is to remove individual rocks at the edges of the sheets and set them separately to ease the transitions from sheet to sheet and render the entire shower floor natural looking — like the stones were scattered by nature tightly together. Another problem with pebbles is “walkability” (yes, I coined that word). Some of the rocks are rounded to the point that standing on them is uncomfortable to say the least. Flat pebbles and sawn stones are easier to walk and stand on. 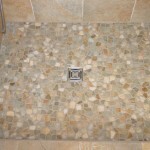 Finally, you can dislodge individual rocks when kneeling on them to grout the shower floor, especially if it is a large one. When setting the sheets and individual stones it’s hard to achieve sufficient contact with the setting mortar (thin-set). 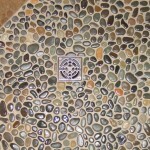 So some of the stones will have to be re-set before covering them with grout. 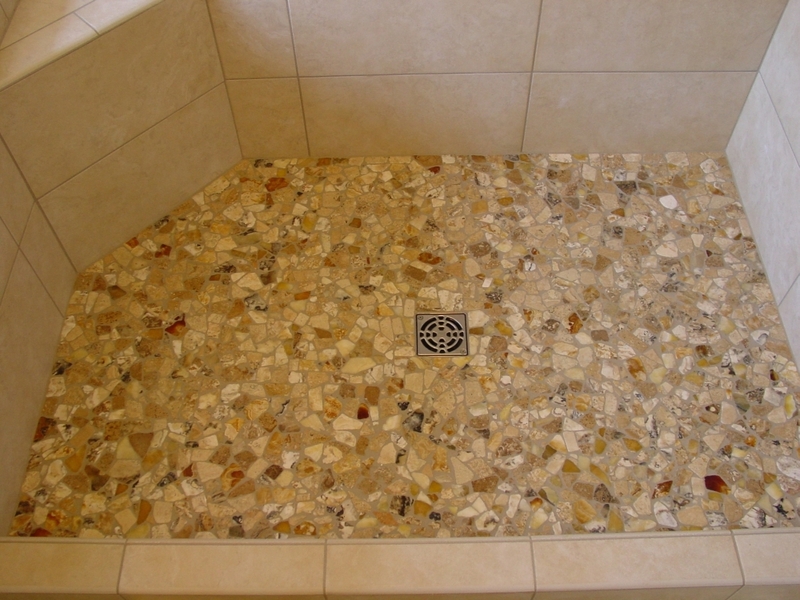 When using rounded pebbles, set them a little higher than the shower drain (1/16 in. to 1/8 in.) 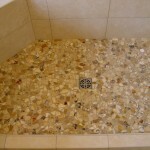 When washed, the grout will be lower than the tops of the pebbles, and the grout will carry water to the drain. 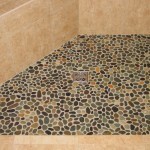 Make sure that grout is high enough. 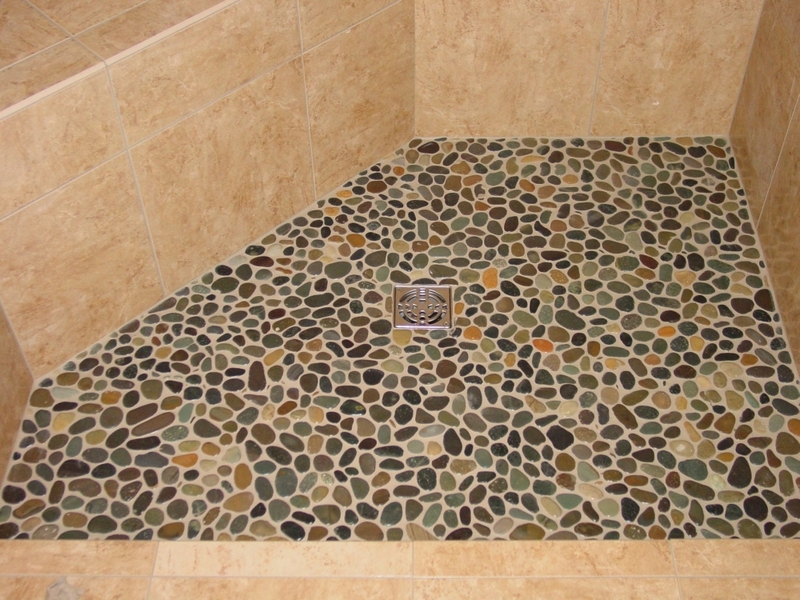 Further, you must let the grout set up an extra few minutes before beginning to wash off the excess, or you’ll wash the grout down too low. 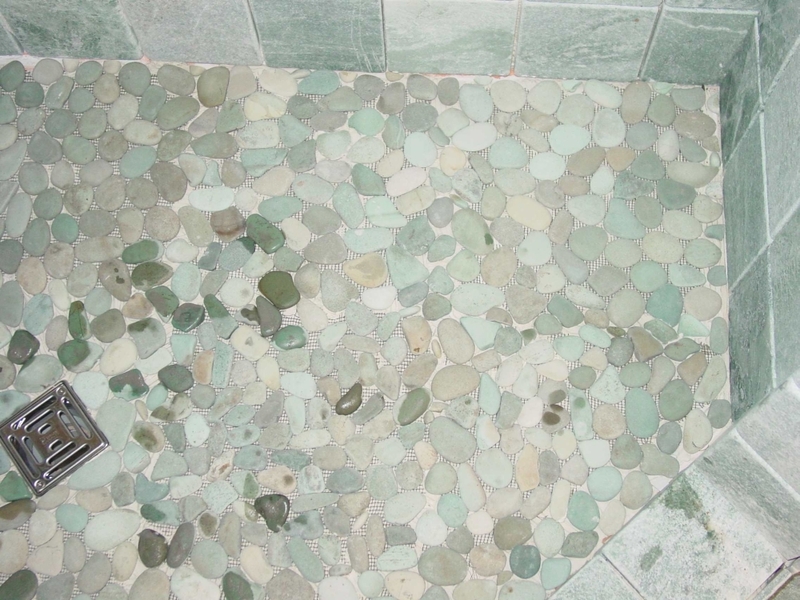 A remedy for this is allowing the first grout job to set up hard (4 to 6 hours) and then re-grouting and washing the floor. 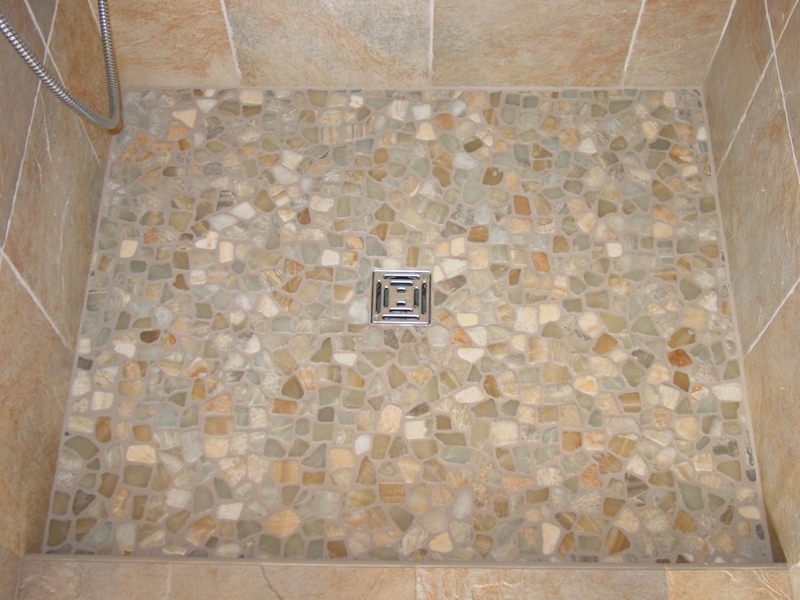 Small tiles (mosaic tiles) on existing shower floors can often be stripped off without serious damage to the mortar underneath. A hammer and masonry chisel will do the work. Don’t forget to protect your eyes. Once the tiles have been removed you can smooth the mortar with a mason’s rubbing stone. 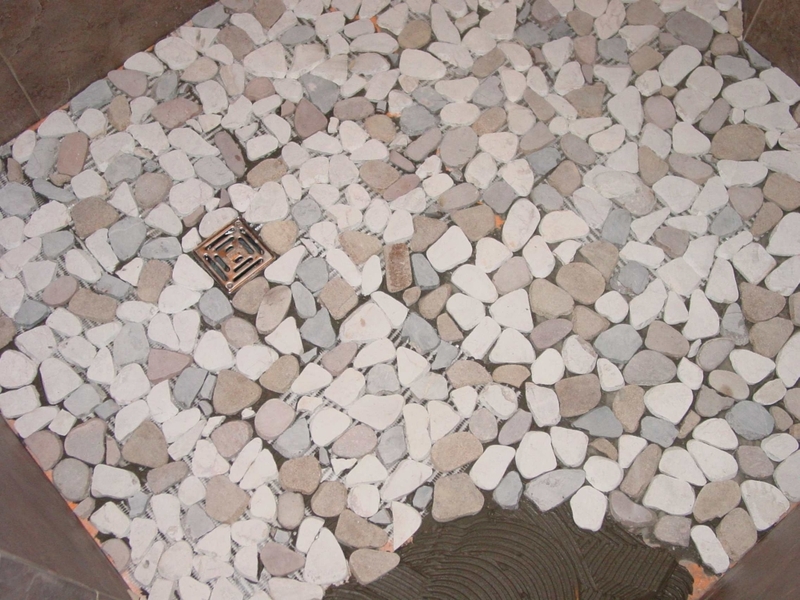 Sweep and vacuum clean the floor before installing the pebbles. You can see the sheet division lines at the left. 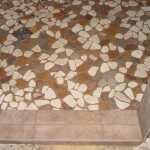 The right side of the floor is blended by removing and re-installing stones at sheet edges. Note that stones with a relatively straight side are placed near the walls. In some cases stones are cut or broken before insertion. This is a good example of proper color and shade blending. As you install the sheets you should keep and eye out for color irregularities. Another example of good color and shade disbursement. The size and shape of the individual stones is also worth keeping an eye on. These are rounded river rocks. Look closely at the edges of the floor. 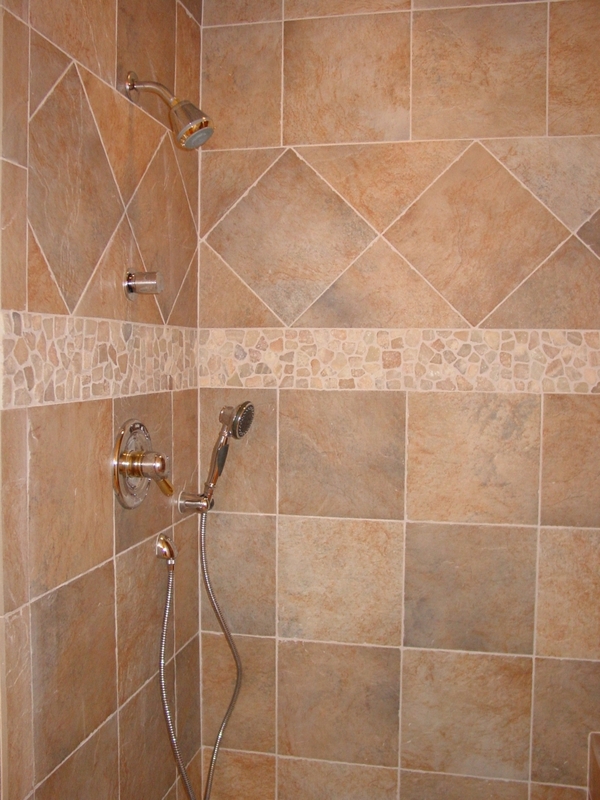 Note how the stones seem to fade into the shower walls. These river rocks have been recently set and not yet grouted.. Water has splashed on some of them, and this simulates the "wet look." 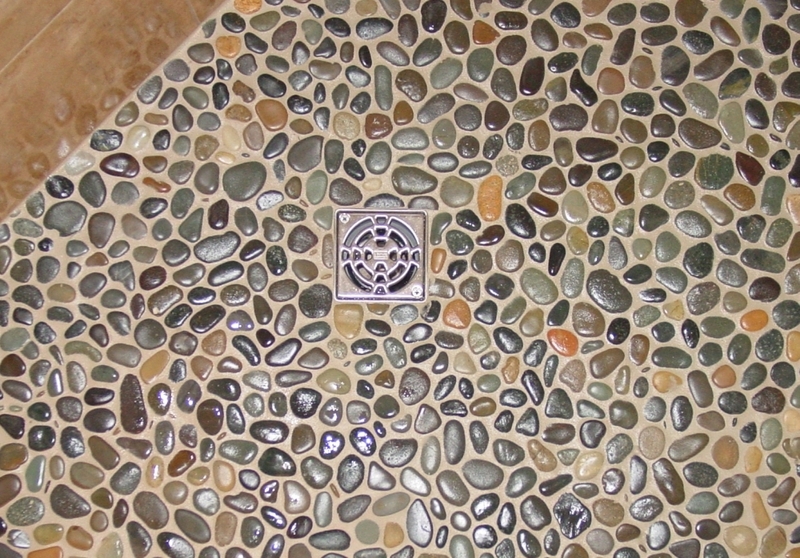 This floor is wet, but the wet look can be accomplished with "enhancer sealer." 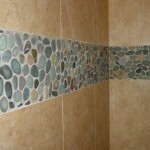 Do the enhancing before grouting. 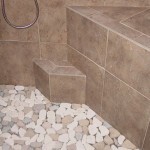 River rocks used as border at eye level on shower wall. 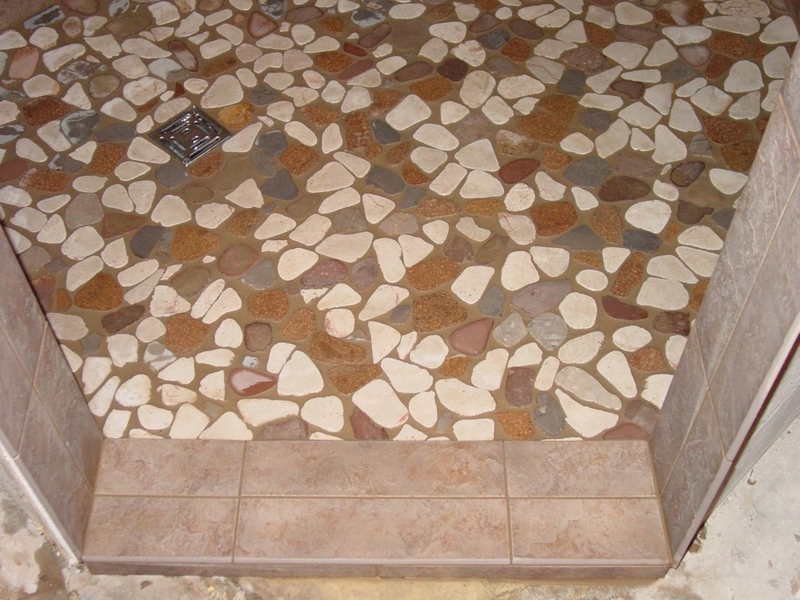 Note how the edges are turned and arranged where stones meet the wall tiles. Sawn stones. When doing borders it's a good idea to keep them out of the way of glass shower enclosures, especially if the stones protrude.